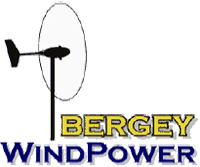 We are dealers for the Bergey Windpower line of wind turbines and equipment. These advanced-technology products let homeowners and businesses generate their own clean power and even spin their utility meter backwards. The turbines are also used for off-grid homes, for rural electrification, and to compliment the performance of solar electric systems. While winter leads to less sun and solar power, the wind increases with winter storms. Leasing is a very affordable option and can also be a tax write-off for businesses. The upfront cost is much lower as well. Many leases offer a buyout option for the system at the end of the lease for $1.